On seeing the title, I thought the book would be a light, relaxing read. The title comes from a 1940 quote from the ‘Queen’s Quarterly’ that states that “the ingredients of a holiday in Canada are idleness, water, and a canoe. 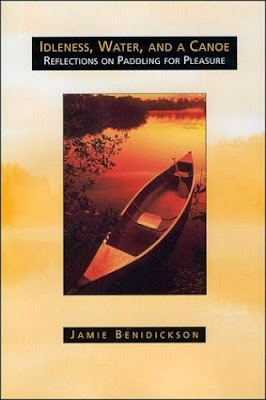 Instead of taking the reader on an idyllic drift down a picturesque stream, it launches into a treatise, a quite detailed coverage of paddling from as many perspectives as you can imagine, and probably some you couldn’t have imagined. The message is that, at least in Canada, canoes and paddling are woven into almost every facet of life, from inclusion in countless forms of advertising and commerce to political cartoons, romance, hunting and fishing, recreation, exploration, youth development, and spiritual, physical and mental health. We are introduced to the line of personalities that moved the canoe from a tool of survival to a recreational gem, starting with John “Rob Roy” MacGregor in 1859. This book may tell you more about canoeing than you ever wanted to know, or it may engender a deeper appreciation for this loved and unlikely member of your family.